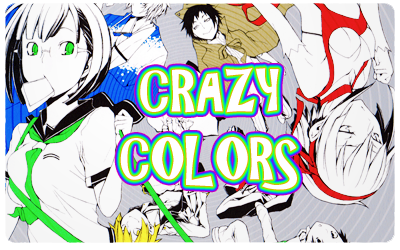 Crazy Colors is an interactive game that you play with the cards you already have in your post! True to its title, it plays similarly to the real card game Crazy Eights. To earn prizes from this game, you'll have to not only be quick, but pay close attention to the comments above yours. ☆ This round, all valid plays from decks with decknames that contain an even number of letters will get an additional two cards! This round closes on Monday, August 13th. ☆ This round is a freebie! All valid plays will earn an additional two cards! This round closes on Monday, July 16th. ☆ This round, all valid plays featuring decks from warm-coloured decks (red, orange, yellow, brown) will receive an additional two cards! This round closes on Monday, July 9th. This round closes on Monday, July 2nd. ☆ This round is a freebie! All valid plays will receive an additional two cards! This round closes on Monday, June 25th. ☆ This round, all valid plays from decks with a deck name that is 3, 6 or 9 letters long will receive an additional two cards! This round closes on Monday, June 18th. ☆ This round, all valid plays from decks featuring a character wearing glasses will receive an additional two cards! This round closes on Monday, June 11th. ☆ This round, all valid plays from decks with a deck name that contain more than 8 letters will receive an additional two cards! This round closes on Monday, June 4th. ☆ This round, all valid plays from decks with a deck name starting with letter A-F will receive an additional two cards! This round closes on Monday, May 21st. ☆ This round is a freebie! All valid plays will receive an additional two cards. This round closes on Monday, May 14th. ☆ This round, all valid plays featuring characters with blue or green hair will receive an additional two cards! This round closes on Monday, March 19th. This round closes on Monday, March 12th. ☆ This round, all valid plays featuring a character wearing glasses will receive an additional two cards! This round closes on Monday, March 5th. ☆ This round, all valid plays featuring a character wearing a hat will receive an additional two cards! This round closes on Monday, February 26th. ☆ This round, all valid plays from red decks will receive an additional two cards! This round closes on Monday, February 19th. ☆ This round, all valid plays from cool-coloured decks (green, blue, purple, gray) will receive an additional two cards! This round closes on Monday, February 12th. ☆ This round is a freebie! All valid plays will receive two additional cards. This round closes on Monday, February 5th. This round closes on Monday, January 1st. ☆ This round, all valid plays featuring a smiling character will get an additional two cards! This round closes on Monday, December 18th. ☆ This round, all valid plays from decks with a deck name that begins and ends with a consonant will get an additional two cards! This round closes on Monday, December 11th.